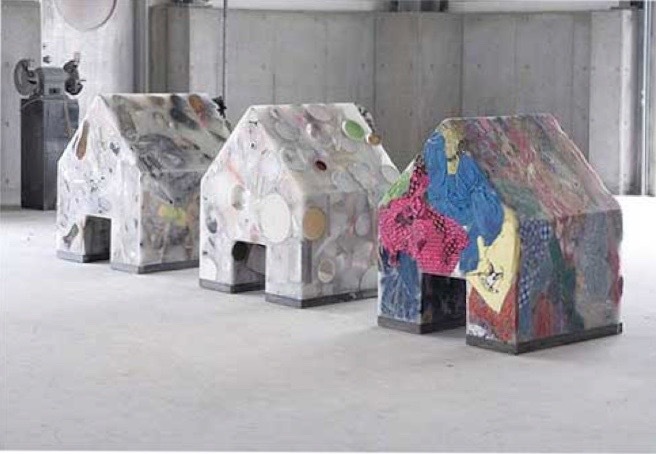 Momoyo Iijima’s art deals with the memory objects possess internally. The second we walk into a museum or a gallery and see a mirror, all our mythological images and psychological models are superimposed onto it: Oh! It’s like Kusama’s Infinity Mirrors! Or: The mirror in Donnie Darko! Or: Lacan’s mirror stage! Mirrors, which have little symbolic meaning for us in daily life, are sacralized in the art space—they take on the rich metaphorical significance we want them to have precisely because they serve no practical purpose there. The question for the artist who seeks to use the mirror is this: how to put one into a gallery in a way that cuts through the static of our preconceived notions? 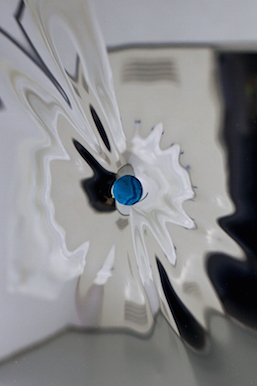 Enter Momoyo Iijima and her current show “A Mirror and Buttons—Connecting Two Worlds” at Galerie Tokyo Humanité. The setup of the show is deceptively simple: A ceiling-height, four-paneled mirror is placed on the far wall with six buttons (each a different color) affixed to it in the shape of the constellation Lyra. At the site of each button, the mirror curves inwards, distorting the reflection. Looking into each button-concavity, your figure ripples and your gaze refracts. Hanging across from the mirror is a shirt on a coat rack. It has six button holes, each corresponding in color to one of the buttons. The installation may call to mind Mono-ha and its theories, such as Lee Ufan’s notion of “Meetings”—art created through the relations of inanimate objects and the dissolving of subject and object in space. Iijima’s piece, however, is also informed by more specific cultural allusions. In the background of A Mirror and Buttons, music from the 1950 French movie Orpheus plays, a variation on the Greek myth of the musician attempting to bring his wife Eurydice back from the underworld. The buttons in the shape of Lyra trace the lyre that Orpheus played so beautifully. Iijima’s work, which the art critic Noriaki Kitazawa has argued is characterized by the blurring of various media, in this case gives way to a tug-of-war between performance and installation—in their relations, are these objects acting out the myth of Orpheus? Are they going to start moving as soon as we turn away? To address these questions, we should look at A Mirror and Buttons in the context of Iijima’s career to date. Iijima’s art largely deals with the memory objects possess internally—more specifically, what shapes this memory would take, or spaces it would fill, if permitted to move freely by the absence or extinction of humans. Her most well-known series ‘Unsealed Home’ encases various household items and clothes in paraffin wax. These wax sculptures rather humorously resemble houses, as if the household items teleologically guide the wax into the shape they’ve always known. Lurking in this memory is also the insidious modern ideology of the heterosexual nuclear family, which equally affects both humans and objects alike. 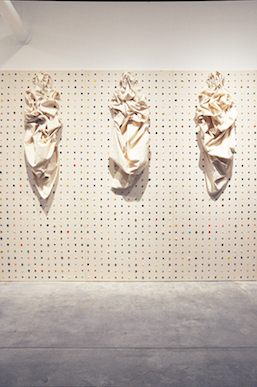 The work colorful stars in the white heavens II (2013) relates directly to Iijima’s current show. In this piece, the artist creates a grid of buttons, all collected from her grandma’s house, and overlays them with sheets that eerily resemble human figures. The cloths receive their ghostly forms from the memory of human contours, preserved in her grandma’s buttons. It doesn’t seem a stretch to read the world contained inside the mirror as completely detached but running parallel to our world, like death. In contrast (or perhaps even defiance) to this world of death are the buttons lodged in the mirror, full of memory and on the threshold between the reflected world and our physical world. Here is where the myth of Orpheus comes back into play: Are these buttons descending into the world of the mirror, or are they attempting to escape back out to their color-coded buttonholes on the shirt hanging so tantalizingly close? Which vector is it? A kind of motion or scene seems promised in the impossibly near future, and yet as long as you wait, they don’t move. 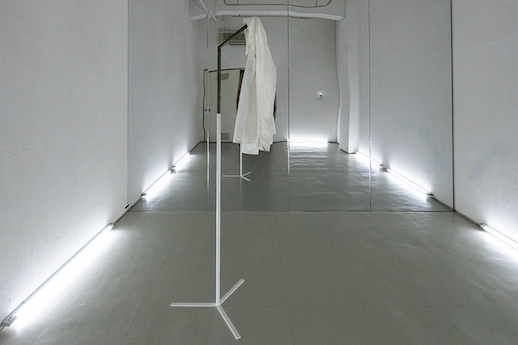 Perhaps if you just wait a little longer…This is the dynamic of an installation that’s really a performance (or vice versa) staged by buttons, a shirt and a giant mirror.